Got a special someone you'd like to send a message to this Valentine's day? Who wouldn't love a crafty handmade card with a personalized message just form you? Or better yet - you can even use these templates to make creative handmade party invitations. Invite your Valentine guests in style with a customized creation by you. 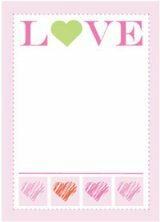 Each of these new holiday creations has it's very own template to help you make Valentines in a snap. And each of these templates is customizable which means you can also personalize all of your Valentines creations! Sometimes less is more. I really liked the simplicity of these cards. Just a simple hand cut word and a paper punch heart glued to the inside to help the words stand out against the plain background. Such a simple way to make Valentines! The template for this card includes the wording to print backwards onto the inside of the card! So all you have to do is use your craft knife to carefully trace the outlines of the words. OK so I'll admit it. I just have a "thing" for colored embroidery floss, and striped baker's twine I just love it And I love to embroider things. So I wanted to create an invitation that had a bit of couture to it, but wouldn't take a day and a half to complete. I think this hand embroidered invitation came out looking sweet, and only took a few minutes to complete. Did I mention there is a printable template to help you along the way? Yes, there is. 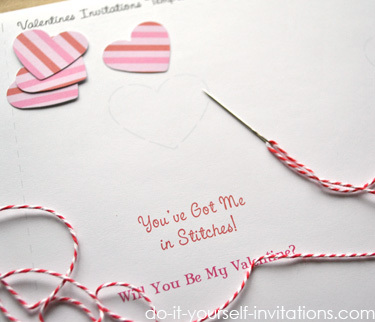 This printable template will not only help you create a personalized invite but also make Valentines with a no-brainer hand embroidered heart. There is a simple pattern included on the card. 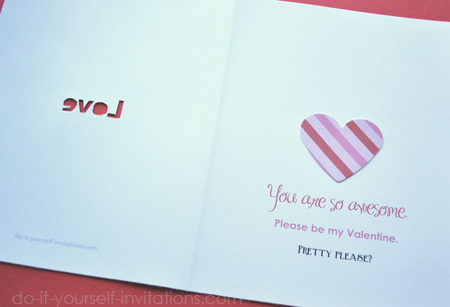 To make this adorable Valentine invitation or card, start by downloading the printable template. Open the template in Adobe Reader and highlight the text to change it to your liking. To change the fonts and colors, etc. highlight the text and press Control and E at the same time. Print the template onto some white cardstock and use the cutting guides to trim the invite/card to size. For a layered card like I show here, you'll want to trim the paper a bit smaller on all side than the 5" by 7" as per the template guides. The template includes a optional backing sheet. You can use the sheet to make double sided invitations, and simply knot the twine or floss at the end of the embroidery. Or you can choose to do as I did, and tape the string to the backside and layer the plain cardstock over the printed backing sheet. I think it came out really cute this way! To embroider the paper simply follow the lines on the heart design and use a large sewing needle to hand sew straight onto the paper. Tape the loose threads down at the start and end of the design. 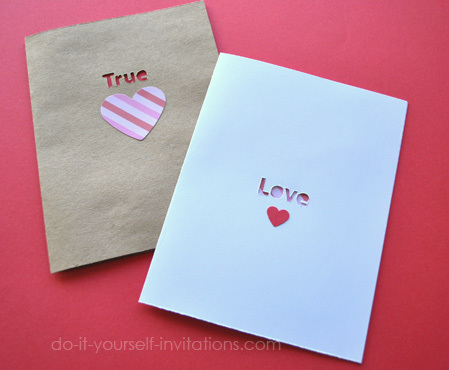 These are a a super simple to make Valentines invitation or card. It's easy! Just start by choosing a fun phrase (or invitation details) and use our template to print it four to a page on a sheet of cardstock. Trim the paper down using the handy dandy cutting guidelines. I also printed the backing sheet from the Hand Embroidered Valentines Invitation to create the heart for the front of the card. 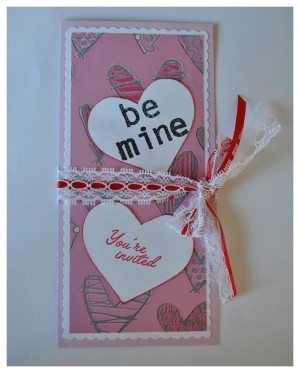 I used a large heart shaped paper punch to make the heart for the front. I threaded some baking twine onto a large sewing needle and poked it straight through the paper heart. I then taped the string to the back of the cardstock and strung it, along with the heart, across the front of the paper and taped it again to the back. I then cut a slightly larger piece of red cardstock and glued the two pieces together, centering the papers as best as I could. Lastly, I attached the papers to a pre-cut scalloped card I picked up at a local Staples office store. The paper was a metallic gold tone which I thought looked nice against the deep red paper. These would look fantastic with a matching envelope and liner! 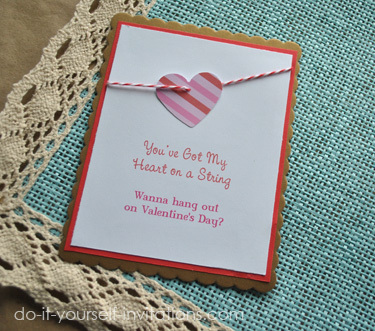 The Old Tried And True - Make Your Own Valentines! Making handmade Valentines can be so much fun. It is a holiday full of romance and whimsy. 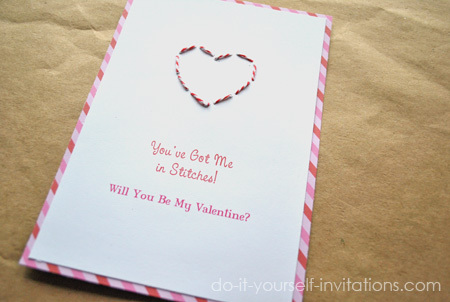 Handmade invitations and greetings cards for Valentines day is a perfect opportunity to let your creative side shine, and have a little fun. 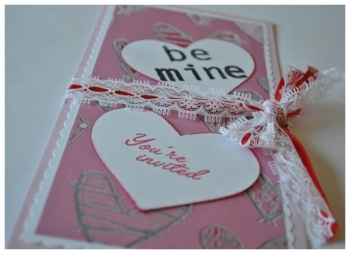 I created these party invitations in the true spirit of the holiday with hearts and romance and love. I love any opportunity to pair pink and red together! I made these invites by pairing a homemade card with some deocrative paper and paper punch hearts. Overall this is a fun and easy project. 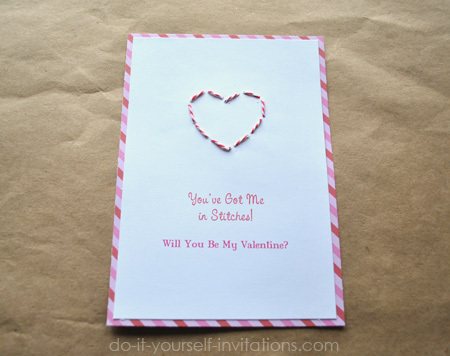 I hope you have fun making your own valentines invitations and cards! 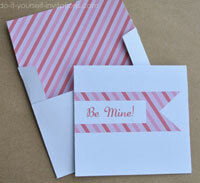 To make Valentines invitations: I started by creating my own cards as the base of the invitations. I simply scored and folded an 8 x 8 piece of pink scrapbooking paper directly in half to create a tall folded card. My favorite tool to use in scoring and folding is a bone folder. It does wonders for this type of project. A true must have. Next I cut two more rectangles of paper to layer onto the front of the invitation. The first was a plain white piece of cardstock. I cut it down slightly smaller than the front of the card and then used paper edgers to give the paper a scallop edge border. The second piece of paper I cut was some decorative paper with a heart pattern. I cut this paper down to a wee bit smaller size then the white cardstock. I then attached the scallop edges card stock to the front of the card using a permanent adhesive glue runner. I centered it onto the front of the card as best as I could. I repeated this step for the deocrative heart paper as well. I used an extra large paper punch to create the hearts to embellish the invite. You could also use a die cut, or simply cut them out by hand. I had a few clear rubber stamp sets lying around and sort of mixed and matched to get the messages stamped onto the hearts. The top heart was stamped with an alphabet set, and I chose the phrase myself. The bottom "you're invited" was from a separate set and the phrase was already in tact. I had "sweethearts" candy in mind when I was creating these hearts. Lastly, to make the heart stand of the paper a bit I used a red chalk ink to distress the edges a bit. I had a craft paint brush lying around and just sort of brushed the ink right onto the edges of the paper. You can also use 3d glue dots to attach them to the front to make them leap off the page a bit. I used a couple of regular glue dot, myself. To finish the project I layered a lace ribbon with a skinny red satin ribbon and simply tied it in a bow around the outside of the card. I did leave a strip of glue runner adhesive across the card to keep the ribbons in place. This would be completely optional. 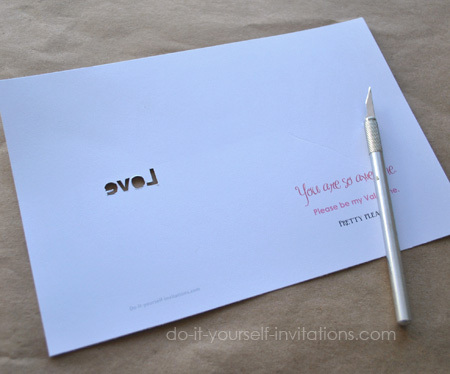 You could either hand write, or rubber stamp into the inside of the card for invitation wording or greeting card verses. You could also print onto some vellum or plain ol' white paper and glue it to the inside of the card. * Switch up your papers and get really creative. You can even use wrapping paper, fabric, or vellum. * Try adding glitter to your heart punch shapes for a little texture and interest.